Published March 7, 2019 By Anna T. This post may contain affiliate links. Regardless, I only recommend sites I've researched and/or used and trust. Tutor.com is a site that hires people as independent contractors to tutor students who need help with their homework via a secured online environment. 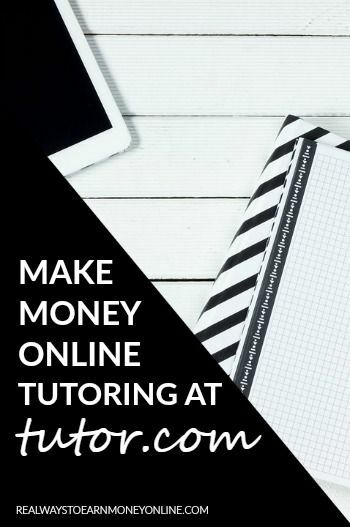 While the most lucrative route to go as a paid tutor is starting your own business, this may offer an opportunity to earn some money if you don't have the means, or the desire, to do that. If you're interested, read on for all the details! How much does Tutor.com pay? Tutor.com pay rates are between $11 and $12 hourly according to Glassdoor. The exact pay rate a person receives depends on the difficulty of the subject and how many hours they have tutored. Bonuses and other incentives are also possible with this company. I looked, but couldn't find any definitive info on how often they pay or what method they use. As of 2007, according to a thread I found on the Work at Home Mom forum, they paid through either check or Paypal. That may no longer be the case. Some reviews on Glassdoor indicate that pay is once a month while others say it is every two weeks. As far as I can tell, this is probably just good for side income. Most of the reviews say that the pay is nothing you can depend on due to the difficulty of getting hours in. This may be a good way to earn a little extra money if you're a college student. What are the requirements to become a tutor for Tutor.com? You must be a US or Canadian resident with eligibility to work in either country, have knowledge in English, math, science, or social studies, be able to demonstrate your ability to explain things to students within their online environment, either be enrolled in or graduated from an accredited US or Canadian college or university, and be able to pass multiple subject exams during their application process. Also, you must be using Windows 10, Windows 8/8.1, or Windows 7. While they will consider Mac users, you must be able to run Windows on your Mac. What is the application process like for Tutor.com? You have to fill out an application online and then take subject exams in whatever subjects you've signed up to tutor in. If you pass those, you go through a mock session with another online tutor. If you pass that, they do a background check on you (which you do NOT have to pay for, from what I understand), and if your background check comes back OK, you can start tutoring immediately. From what I've read, the application and testing process goes pretty quickly, but waiting for them to do your background check could take up to one week. If you take the exams and they don't happen to need tutors in your subject at the moment, you'll go on a wait list before they do the background check and officially hire you. We do have a list of companies that, as far as our research has determined, do not do background checks prior to hiring you if that is something you're looking for. How does the tutoring process go? Once hired, simply log in to their system and wait for students who need tutoring. The wait time is paid, although it's only $5.50 an hour. Still, that's not bad for doing nothing! You have exactly ten seconds to respond once you receive an alert that there is a student online waiting to be tutored. If you are fast enough and get a student to tutor before another tutor logged on at the same time as you, you enter an online “classroom” and begin chatting with them to help with whatever homework advice they need. You can apparently tutor via a chat or voice interface. The student you are tutoring has the opportunity to rate your performance once the session is over. Are there any specific hours you have to schedule yourself to work? You can tutor whenever you are available to tutor. Demand is highest during the times of year when school is in session. It's supposedly much slower around Christmas break and through the summer. The need for tutors also tends to increase between the hours of 4 p.m. to 11 p.m. (when school has let out). Tutor.com does cap you at 28 hours per week so that you are not getting full-time hours. We do have a list of full-time work at home jobs if you absolutely must have 40 hours per week. Does Tutor.com hire people from outside the United States? Yes. Tutor.com currently hires people from the United States and Canada. Absolutely. I see no reason to think it is a scam. I also believe this would be a good opportunity for anyone who meets the qualifications and has a knack for teaching/explaining things. The research I've done indicates that they pay their tutors. Some say the job is very rewarding when you know you've helped a student. Others say that it can get frustrating at times because you occasionally end up with students who don't care to be rude to you, say harsh things, and give you poor ratings — particularly if you can't help them. Just click here to go ahead and get started applying at Tutor.com if you're interested. If they are not currently hiring, I have more online tutoring jobs listed. You might also consider doing some ESL (English Second Language) tutoring. There are many companies hiring for this as well! Post originally published on January 14, 2011. Updated and republished on March 7, 2019. I just started working for them. Currently, you are paid based on 3 factors: your status (Probationary-just starting, Tier 1, 2, or 3), the subject you are tutoring in, and whether or not the tutor is actively tutoring during a pre-scheduled shift (yes, you get paid just for being online during a shift that you have scheduled yourself for available). Pay is direct deposit and once a month, usually processed between the 6th and 10th of the month. Kotsu, Halina said she did 15 sessions. Tutor.com suggests each session run 20-30 minutes (although you can work with them longer if they need it). So it’s not like each session is an hour. She probably has only worked a few hours (maybe 5). But she also probably had sessions shorter than 20 minutes since we’re helping students maybe with just one question real quick. And the wait time is a different pay ($5.50 from what I understand). Halina also said she’s in a probationary period. Once she gets past that the pay goes up to $11. It continues to increase with the next two levels as well. For someone who is still in college (like me) and wants a flexible schedule (an actual flexible schedule – not the “flexible” you get when working retail when they want YOU to be flexible but they are not) or someone who has to stay home with young children (like me also), it’s a great opportunity to get a little experience from home. You were saying after gas for driving you make about $30 per hour. You did not include the extra wear and tear on the vehicle being used. And what if you also had a child (or a few children) you had to pay someone to watch? Around here a good sitter could cost $10-$15 per hour. That cuts in to profits significantly. Plus, since I’m not yet a certified teacher I would have to charge less for tutoring. Ultimately I’d be making about the same amount of profit with a lot more hassle if I had to drive to students’ houses. Plus it is not as steady when you are tutoring yourself. Not to mention, we’re a one car household and my husband uses it to go to his classes most of the day). Tutoring online allows me to be home with my 2yr old (instead of leaving her with someone I might not know as well or who might not take care of her the way I would want her to be cared for) and not have to use the car, gives me a few extra bucks without too much effort on my part (since teaching comes naturally to me anyway), and I know if I have an emergency the students will not miss out on their education because there are other tutors available. I went to their web site, tutor.com, this morning (10/12/2012) and learned they pay monthly by either direct deposit or by paper check. There are a lot of advantages to choosing your own hours and working from home, so it’s great to know tutor.com is available. Halina, how can you be making $9 an hour? If you’ve done 15 sessions and made only $30, you’ve been working for $2 an hour. Is that the case? If so, your pay would be far below the minimum wage law requirements. If anyone knows their current pay rates, particularly for English and library tutoring, please post them. When I called to speak with them, I got only a voice mailbox. Frankly, when I see “$9 to $13 per hour” I think, for this I went to college?! Their site says very little about pay, just one sentence I managed to locate indicating their highest paid chemistry tutors average $600 a month. Not knowing how many hours they worked or whether all tutors are paid equally, this info is useless. So if you don’t really need to stay home consider the alternative. I find that depending upon one’s expertise, location, and employer wealth (local cost of living and income of employers naturally affects pay rates), driving to a student’s home nets 4 to 6 times the amount posted in this article. Even in this economy, as a retired teacher of English with a broad resume — I am earning $50 an hour. Granted, appropriate compensation only materialized after I owned my own worth as a professional and read a few pages telling me exactly what to say during salary negotiations (luckily I stumbled upon Mikelann Valterra), but now that I’m being firm about what I’m worth, I’m attracting wealthy clients (go figure!). They understand that their children’s education is like anything else — you get what you pay for. Are you talented at what you do? Do you know your content backward and forward? Own it! Look at all your costs in going to the students’ homes, of course. I drive on average half an hour each way = 1 hour in total drive time. Therefore, to make the trip worthwhile, I require a 2 hour minimum tutoring time per visit. Altogether I am committing 3 hours and grossing $100. On average, gas costs me $8 per trip, so net profit = $92. Divide that by 3 hours and the net is still $30.61 per hour. All I’m saying is, if you don’t have to work at home, do your homework to see if you’d rather earn what your expertise is truly worth. Namaste, my beautiful teacher sisters and brothers! Thanks to this blog post, I applied and became a tutor at Tutor.com. I am still on my probationary period (I think I only have about 15 sessions logged so far), but my direct deposit from the site did arrive yesterday. I made just over $30, though for how many hours I have no clue. I currently make $9/hr for my science and careers tutoring. Congrats Halina! I hope you enjoy it!